Here is a message from Maui and Sons! 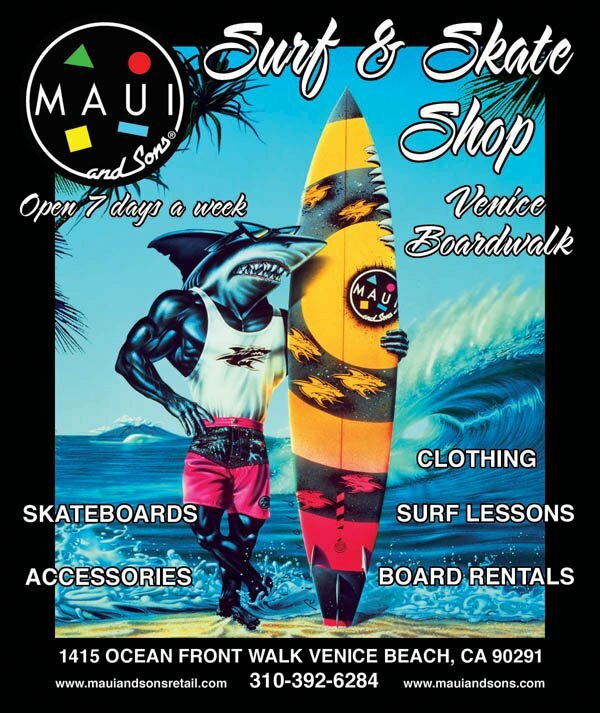 We are located right next to the World Famous “Sidewalk Café” on the Venice Boardwalk, we are in front of the Venice Beach Skate Park and we are just the spot for travelers who want to rent surfboards, get a lesson or two, and get styled out in the latest designs from your favorite surf and skate brands. Our Surf Instructors are second to none. We are proud to brag that our instructors are all locals, having grown up on the beaches of Southern California; they haven’t missed to many days catching waves over the years. Each of our Instructors has traveled to places around the world surfing amazing waves, tasting native foods, and hanging with the locals. They always come back with grand stories of gnarly tubes, narrowly escaping killer sharks and recently one Gisele Bündchen sighting in Costa Rica. If you want to learn to surf, we promise you a fun learning experience at a great value with instructors who will be stoked to help you catch your first wave. ID or Passport plus Deposit is Required for all rentals. .Location one: 1415 Ocean Front Walk. (By Venice Skatepark) Venice, Ca. 90291 | 310.392.MAUI (6284). Next ArticleGreen Goddess Collective is Recreational!